Supernovae are extremely energetic and dynamic events in the universe. The brightest one we’ve ever observed was discovered in 2015 and was as bright as 570 billion Suns. Their luminosity signifies their significance in the cosmos. They produce the heavy elements that make up people and planets, and their shockwaves trigger the formation of the next generation of stars. There are about 3 supernovae every 100 hundred years in the Milky Way galaxy. Throughout human history, only a handful of supernovae have been observed. The earliest recorded supernova was observed by Chinese astronomers in 185 AD. The most famous supernova is probably SN 1054 (historic supernovae are named for the year they were observed) which created the Crab Nebula. Now, thanks to all of our telescopes and observatories, observing supernovae is fairly routine. But one thing astronomers have never observed is the very early stages of a supernova. That changed in 2013 when, by chance, the automated Intermediate Palomar Transient Factory (IPTF) caught sight of a supernova only 3 hours old. Spotting a supernovae in its first few hours is extremely important, because we can quickly point other ‘scopes at it and gather data about the SN’s progenitor star. In this case, according to a paper published at Nature Physics, follow-up observations revealed a surprise: SN 2013fs was surrounded by circumstellar material (CSM) that it ejected in the year prior to the supernova event. The CSM was ejected at a high rate of approximately 10 -³ solar masses per year. According to the paper, this kind of instability might be common among supernovae. SN 2013fs was a red super-giant. Astronomers didn’t think that those types of stars ejected material prior to going supernova. But follow up observations with other telescopes showed the supernova explosion moving through a cloud of material previously ejected by a star. What this means for our understanding of supernovae isn’t clear yet, but it’s probably a game changer. Catching the 3-hour-old SN 2013fs was an extremely lucky event. The IPTF is a fully-automated wide-field survey of the sky. It’s a system of 11 CCD’s installed on a telescope at the Palomar Observatory in California. It takes 60 second exposures at frequencies from 5 days apart to 90 seconds apart. This is what allowed it to capture SN 2013fs in its early stages. Our understanding of supernovae is a mixture of theory and observed data. We know a lot about how they collapse, why they collapse, and what types of supernovae there are. But this is our first data point of a SN in its early hours. SN 2013fs is 160 million light years away in a spiral-arm galaxy called NGC7610. It’s a type II supernova, meaning that it’s at least 8 times as massive as our Sun, but not more than 50 times as massive. Type II supernovae are mostly observed in the spiral arms of galaxies. A supernova is the end state of some of the stars in the universe. But not all stars. Only massive stars can become supernova. Our own Sun is much too small. Stars are like dynamic balancing acts between two forces: fusion and gravity. As hydrogen is fused into helium in the center of a star, it causes enormous outward pressure in the form of photons. That is what lights and warms our planet. But stars are, of course, enormously massive. And all that mass is subject to gravity, which pulls the star’s mass inward. So the fusion and the gravity more or less balance each other out. This is called stellar equilibrium, which is the state our Sun is in, and will be in for several billion more years. But stars don’t last forever, or rather, their hydrogen doesn’t. And once the hydrogen runs out, the star begins to change. In the case of a massive star, it begins to fuse heavier and heavier elements, until it fuses iron and nickel in its core. The fusion of iron and nickel is a natural fusion limit in a star, and once it reaches the iron and nickel fusion stage, fusion stops. We now have a star with an inert core of iron and nickel. Now that fusion has stopped, stellar equilibrium is broken, and the enormous gravitational pressure of the star’s mass causes a collapse. This rapid collapse causes the core to heat again, which halts the collapse and causes a massive outwards shockwave. The shockwave hits the outer stellar material and blasts it out into space. Voila, a supernova. The extremely high temperatures of the shockwave have one more important effect. It heats the stellar material outside the core, though very briefly, which allows the fusion of elements heavier than iron. This explains why the extremely heavy elements like uranium are much rarer than lighter elements. 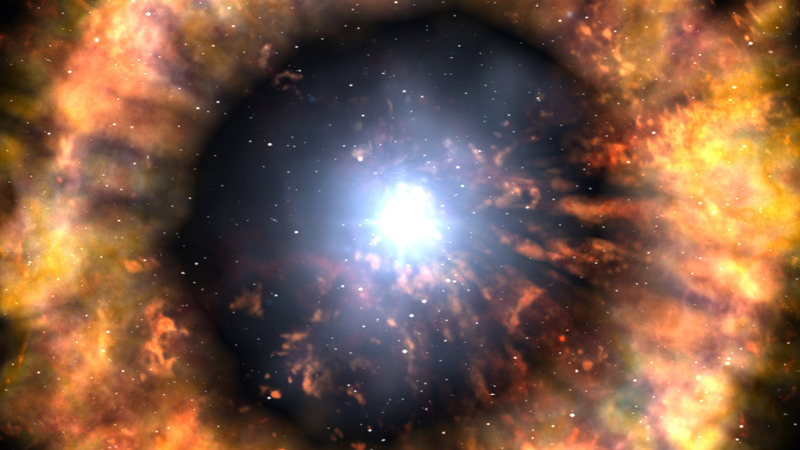 Only large enough stars that go supernova can forge the heaviest elements. In a nutshell, that is a type II supernova, the same type found in 2013 when it was only 3 hours old. How the discovery of the CSM ejected by SN 2013fs will grow our understanding of supernovae is not fully understood. Supernovae are fairly well-understood events, but their are still many questions surrounding them. Whether these new observations of the very earliest stages of a supernovae will answer some of our questions, or just create more unanswered questions, remains to be seen. So a glimpse of a supernova explosion is of intense interest to astronomers. It’s a chance to study the creation and dispersal of the life-enabling elements themselves. A greater understanding of supernovae will lead to a greater understanding of the origins of life. Stars are balancing acts. They are a struggle between the pressure to expand, created by the fusion in the star, and the gravitational urge to collapse, caused by their own enormous mass. When the core of a star runs out of fuel, the star collapses in on itself. Then there is a massive explosion, which we call a supernova. And only very large stars can become supernovae. The brilliant flashes that accompany supernovae are called shock breakouts. These events last only about 20 minutes, an infinitesimal amount of time for an object that can shine for billions of years. But when Kepler captured two of these events in 2011, it was more than just luck. Peter Garnavich is an astrophysics professor at the University of Notre Dame. He led an international team that analyzed the light from 500 galaxies, captured every 30 minutes over a period of 3 years by Kepler. They searched about 50 trillion stars, trying to catch one as it died as a supernova. Only a fraction of stars are large enough to explode as supernovae, so the team had their work cut out for them. In 2011 Kepler caught two gigantic stars as they died their supernova death. Called KSN 2011a, and KSN 2011d, the two red super-giants were 300 times and 500 times the size of our Sun respectively. 2011a was 700 million light years from Earth, and 2011d was 1.2 billion light years away. The intriguing part of the two supernovae is the difference between them; one had a visible shock breakout and one did not. This was puzzling, since in other respects, both supernovae behaved much like theory predicted they would. The team thinks that the smaller of the two, KSN 2011a, may have been surrounded by enough gas to mask the shock breakout.